Imagine if someone, somewhere were keeping track of all your happy memories and that at some point you would have to pay (literally) for them. 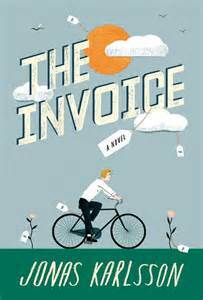 That's the idea behind the quirky book The Invoice by the Swedish author and actor Jonas Karlsson. The story begins as our unnamed narrator receives a strange invoice in the mail for over 5,700,000 kronor (about $800,000 in US money). His name is on the bill, but there's no clear indication about what the bill is actually for. Has he ordered some high-ticket item and forgotten about it? Are the commas in the wrong places, and maybe it's supposed to be a bill for 57,000 instead (still an outrageous sum, but easier to wrap your head around). Since there must clearly be some mistake, he throws the bill in the trash and heads off to work at the video store. He only works part-time at the video store, and even when he's at work, there's not a lot to do. He is a film buff, so it is enjoyable for him to be able to speak to the rare customer who comes in about film in general and more especially about rare or unusual films. His slacker friend Roger also drops by from time to time, but with no romantic partner, the narrator leads a quiet life of work, going home to his small apartment to watch movies, play video games or listen to music and occasionally meet Roger for some not-very-exciting-or-adventurous outings. So he is disturbed and somewhat alarmed to receive another invoice, this one even higher due to the "late fees" being added. There is a customer service number to call, and after being on hold for many hours, he's finally able to speak to a customer service representative. She tells him her name is Maud and asks what she can help him with. As he begins to explain the gigantic bill that he's received in error, Maud is aghast. Hasn't he been watching the news? Seen all the leaflets? Walked by all the posters in town? Everyone knows about the Invoices. It seems that the world powers-that-be have gotten together and designed the ultimate wealth re-distribution scheme. Those who are happiest and having the best lives are charged most, and once they've paid in what they owe, the funds will be redistributed to those who haven't been as fortunate. Maud goes on to question the things that the narrator enjoys -- sunshine, his apartment, the smell of flowers, etc. She explains that none of that is free, and that now it's time to pay up. The narrator becomes increasingly upset as he attempts to convince WRD (World Resources Distribution, the company behind the invoices) that he doesn't have any money or assets to pay such a large bill. He assumes that there must have been a mistake somewhere in the accounting. After several visits to the WRD headquarters (all the while trying to get a glimpse of Maud, his phone advisor), the situation doesn't seem to be getting better. Will anyone listen to him? Why does he owe such an astronomical amount when others who seem to be doing so much better than he is received lower invoices? Can he ever hope to pay off such a large sum? I really enjoyed this slim book, and all the ideas it puts forth -- the most successful people aren't always those with the most money; you can be happy with your life even if you don't have much materially to show for it; misfortune can be a good thing in helping us to grow and mature; some people will never be happy even if things are turning out well for them. I enjoyed Jonas Karlsson's first book The Room as well, and I hope both books will eventually be turned into films.